The Otolith – The otolith is a blog containing the thoughts of a fisherman and biologist. Welcome to my life. Approximately 2 million years ago, towards the beginning of the Pleistocene epoch, a group of coastal salmonids found their way inland by way of the Columbia River basin. These salmonids remained inland untouched and left to evolve into coastal, westslope, Lahontan, and Yellowstone cutthroat trout. The Yellowstone cutthroats in the headwaters of the Snake River migrated into the Colorado River basin and eventually crossed the continental divide establishing residence within the Arkansas and South Platte River basins in Colorado. This new easterly population of cutthroats evolved into what is now the modern day the Greenback cutthroat trout somewhere around 70,000 years ago. In the mid to late 1800’s the greenbacks’ habitat slowly became degraded as irrigation practices and mining operations encroached on their native range. By 1937 the greenback cutthroat trout was thought to be extinct. Fortunately, two small populations were discovered in the late 1950’s and early 1960’s. After Congress passed the Endangered Species Act of 1973 these salmonids found protection under the act. As years passed, more populations were discovered eventually promoting the greenback’s status to threatened. In 1983 a recovery plan was implemented in a joint effort by the Colorado Division of Wildlife (now the Colorado Parks and Wildlife), United States National Park Service, United States Forest Service, and the United States Bureau of Land Management to re-establish new populations and to maintain and monitor the few delicate populations that remained. The interagency effort was largely a success and by the mid to late 1990’s 20 populations had been established as well as officially naming the greenback cutthroat trout as Colorado’s state fish (which replaced the rainbow trout that had been the state’s fish since 1954). As efforts continued, there were hopes of completely delisting the greenback cutthroat trout by 2006. However, management and recovery efforts came to a nightmarish halt in 2007 when a research paper published in the journal Molecular Ecology released definitive, molecular evidence showing greenback stocking efforts had been stocking Colorado River cutthroat trout in lieu of the greenback cutthroat trout. The Colorado River cutthroat trout was introduced into the greenback’s native range around 1900, and considering the two salmonids are virtually indistinguishable, the Colorado River subspecies was mistakenly sent to hatcheries and eventually stocked into rivers and estuaries as greenbacks. This unfortunate setback put the greenbacks at its greatest risk of extinction since the two small populations were discovered in the 1950’s. As of 2017, conservation and recovery efforts are making valiant efforts in re-establishing pure greenback cutthroats in their native range. Many populations now exist which provide the angler with a unique opportunity to chase a beautiful species from the last glacial epoch of the Pleistocene. Anglers visiting Colorado can find dozens of lakes to discover and miles of rivers to explore all containing plenty of greenback cutthroat trout and all within short driving distance of Denver. In 1964 Congress passed the Wilderness Act protecting vast tracts of wilderness throughout the United States. Fourteen years later, Congress designated 77,700 acres of land bordering Rocky Mountain National park as Indian Peaks Wilderness area. Since then it has been a popular destination for outdoor enthusiasts seeking solitude and pristine wilderness. However, many waters within the area see little to no fishing pressure. 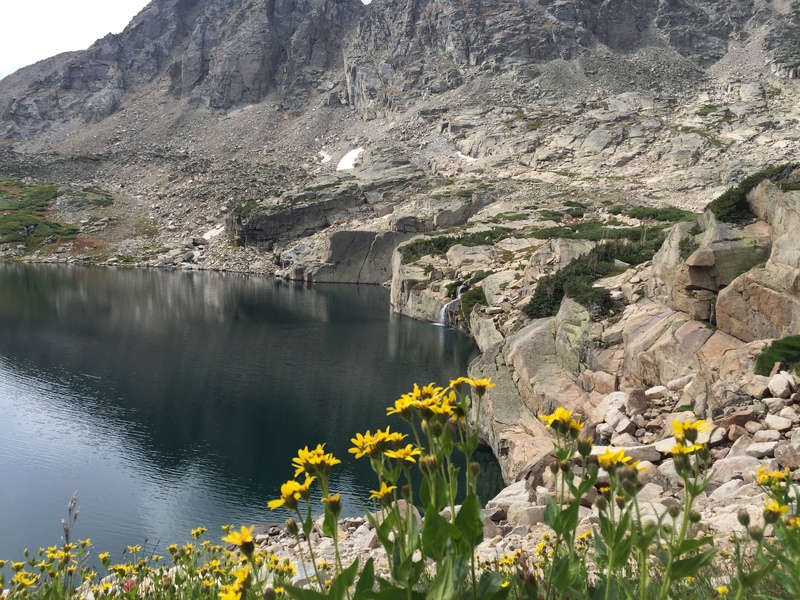 Blue Lake sits at an elevation of 11,311 feet and covers approximately 22 acres with stunning scenery surrounding it. As one of the deepest lakes in Indian Peaks, greenbacks have plenty of water grow to trophy size. The cutthroats in this body of water can be slightly spooky due to the popularity of this short and beautiful hike. However, if an angler is patient large cutthroats can be caught. The northeast shore provides a shallow shoreline that cutthroats cruise looking for aquatic morsels. The trail leading to upper Blue Lake follows this shoreline and at times can receive plenty of foot traffic from hikers. This shoreline has access to the deeper parts of the lake that provides weary trout with an easy escape from pressure and foot traffic so fishing this area requires stealth and patience, but is greatly rewarding. The southern shore receives far less hiking traffic. A shelf runs along a good portion of this area of the lake and cutthroats can be found holding tight to this structure. Climbing up the hill side provides an angler with a bird’s eye view of this area of the lake where trout can be spotted feeding on chironomids. Watch carefully to pattern these fish before making an approach because some of the largest cutthroats in the lake utilize this area. Blue Lake can be accessed by the Mitchell Lake trailhead near Ward, Colorado. The short 2 mile hike provides the angler with ample fishing opportunities. The Mitchell Lakes and the surrounding streams hold vast numbers of brook trout and hybrid cutthroat trout that are willing to chase dry flies. Be sure to bring a camera as the scenery and wildlife is stunning in this area. It is not uncommon to see several moose on this short hike. Countless streams exist within Indian Peaks. Most of these rivers hold good populations of cutthroats, rainbows, browns, and brook trout that will keep an angler busy for hours. 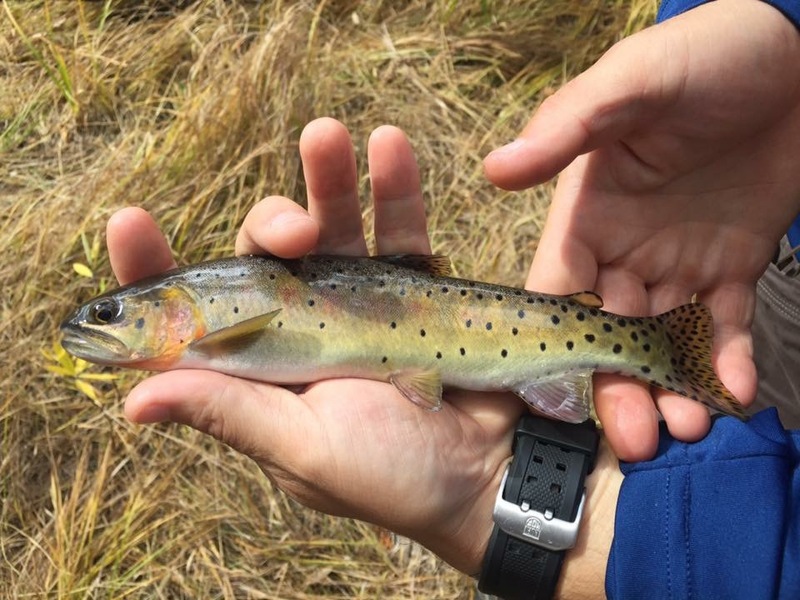 There is considerable effort to reestablish cutthroats in their optimal stream habitat, however, their ideal habitat is shared with other non-native trout species such as the brook trout. Because of this, most stocking efforts of greenbacks will be in the higher elevations of streams and rivers near the headwater reaches so a little effort off the beaten path will reward an angler with exquisite cutthroat trout. When exploring streams in Indian Peaks look for impassable structures in streams as biologist use these fluvial impasses to keep non-native species separate from stocked populations of greenback cutthroat trout. Keep in mind that stealth is required due to the small stream size. You will be in close proximity of these amazing fish and one wrong move will spook an entire pool worth of fish. Once you have found a promising cutthroat stream, look for deeper, slower pools. Greenbacks tend to prefer this type of stream characteristic and usually multiple fish can be found in a single pool. Rocky Mountain National Park became recognized as the 10th national park on January 26, 1915. Since then it has been a top destination in northern Colorado for outdoor activities. Today, roughly 3.5 million people visit the park annually, but a small portion of that utilize the fishing opportunities within Rocky Mountain National Park and an even smaller portion of fisherman chase greenback cutthroat trout. Perhaps the easiest stretch of river that holds cutthroats is the Big Thompson River headwaters in Moraine Park. To get to Moraine Park enter Rocky Mountain National Park through the Beaver Meadows entrance. Follow the signs to Moraine Park and ultimately to the Fern Lake trailhead. This easy hike follows the Big Thompson River and has many accessible and fishable stream reaches. The best greenback cutthroat trout fishing along this stretch begins at the “Bridge Pool” hole. This is where the trail crosses the river and continues up to Fern Lake. Many brilliantly colored cutthroats can be caught at this hole, but with a little off trail effort dozens of cutthroats can be caught in Forrest Canyon which is home to the Big Thompson headwaters. For those anglers wishing to escape the crowds, Arrowhead Lake in the Gorge Lakes area provides incredible scenery and remote fishing. Sitting at an elevation of 11,158 feet, Arrowhead Lake is one of the few lakes in the area that holds a healthy population of trophy cutthroat trout. The trout in this particular lake always seem to be brilliantly colored and above average in size. The cutthroats here cruise the shoreline looking to take advantage of hatching insects during the abbreviated growing season. There are camping opportunities available in the Gorge Lakes region of Rocky Mountain National Park but permits must be acquired before spending the night in the backcountry. Permits usually go on sale early in the spring and fill up quickly so planning ahead will save some headache. Arrowhead can be reached through the Poudre Lake trail right off Trail Ridge road, but the last portion of the hike is off trail so detailed maps and backcountry experience is recommended. When chasing greenbacks on high mountain headwater streams an 8’0” 3 or 4 weight fly rod rigged with a weight forward floating line does nicely. When fishing high elevation lakes an angler can count on the wind to blow. A 9’0” 5 weight allows an angler to cut through the wind a little better than a 3 or 4 weight but still light enough to handle the lighter tippet and smaller flies sometimes needed to entice bites. For leaders, a 7.5 foot 5X tapered leader with 1 to 1.5 feet of matching tippet will land countless cutthroats. Greenbacks in the high country can be spooky but are generally not extremely leader shy. An angler can get by with a 4X leader and, if conditions allow, even a 3X. Most people over think fly selection for high elevation and backcountry excursions. Cutthroats are opportunistic insectivores meaning if it looks buggy they will at least make an approach to investigate. Due to the short growing season, most greenbacks will not be terribly picky if an aquatic morsel is presented well so focus on subtle and well delivered presentations as opposed to exactly matching the hatch. Utilize fly patterns that look like everything yet do not resemble any one insect in particular. Patterns like Parachute Adams, Stimulators, Hares Ears, Copper Johns, etc. Carrying patterns of the Swiss army knife variety will ensure an angler has a broad range of insect life covered in their fly box as well as keeping gear to a minimum. Two other important patterns to consider are chironomids and scuds. Chironomids make up a huge portion of a trout’s diet and since they hatch anytime the water is thawed an angler should have a few patterns in their fly boxes. The backcountry chironomid and chromies are good places to start. For the adult stage, Griffith’s gnat and mosquitos do well in most situations. Scuds are common in lakes with a lot of vegetation and provide a great source of calories for cutthroats looking to gorge during the summer months. Any standard scud pattern will work; greys, olives, and oranges seem to be the best colors for summer months. Try not to toss streamers to greenback cutthroat trout as these salmonids are predominantly feeding on insects; there is very little evidence to suggest they feed on vertebrate prey. Most greenbacks are found at elevation and their home waters have little to no baitfish in them. However, this not to say they will not hit a streamer pattern out of aggression or curiosity. 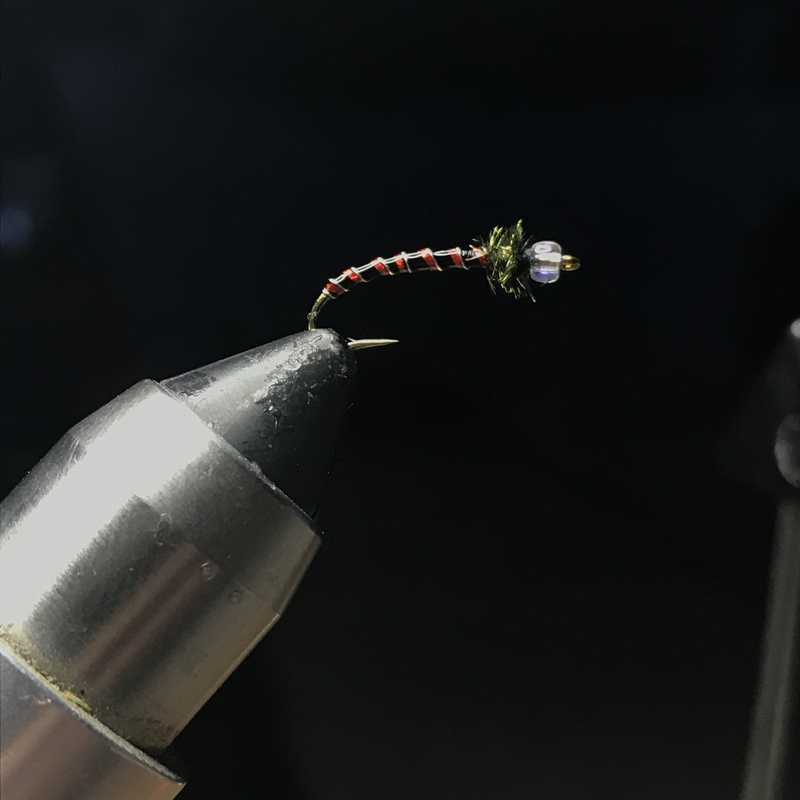 An angler’s time is better spent throwing flies other than streamers, but if the temptation is too great, a small black or olive wooly bugger in smaller sizes can imitate small leeches very well. 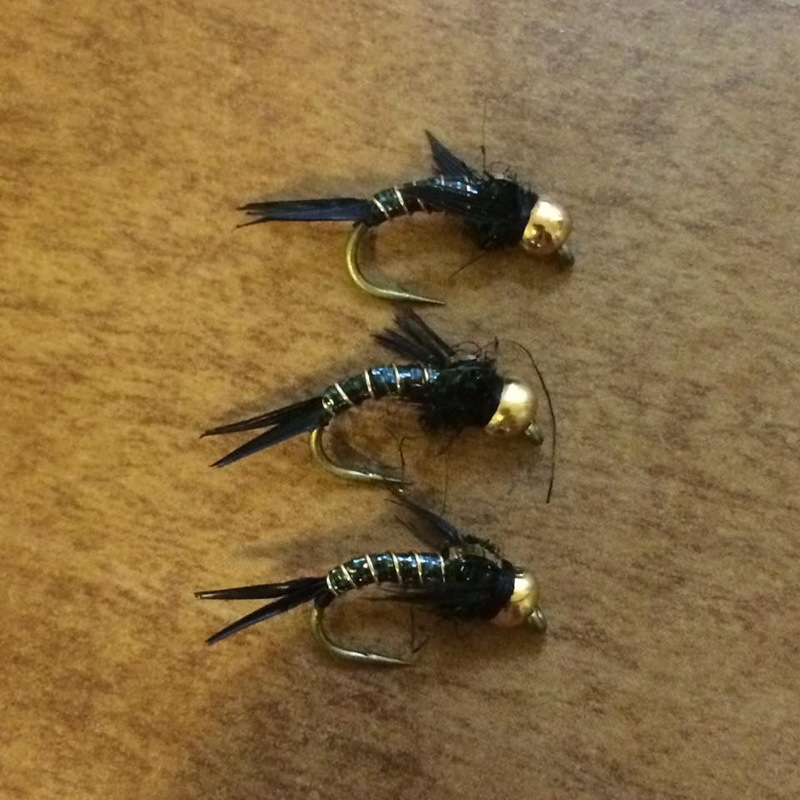 Fly sizes vary depending on the water being fished. In streams, size 14-18 for nymphs and sizes 14-20 in dry flies. In lakes, slightly larger flies tend to produce better. 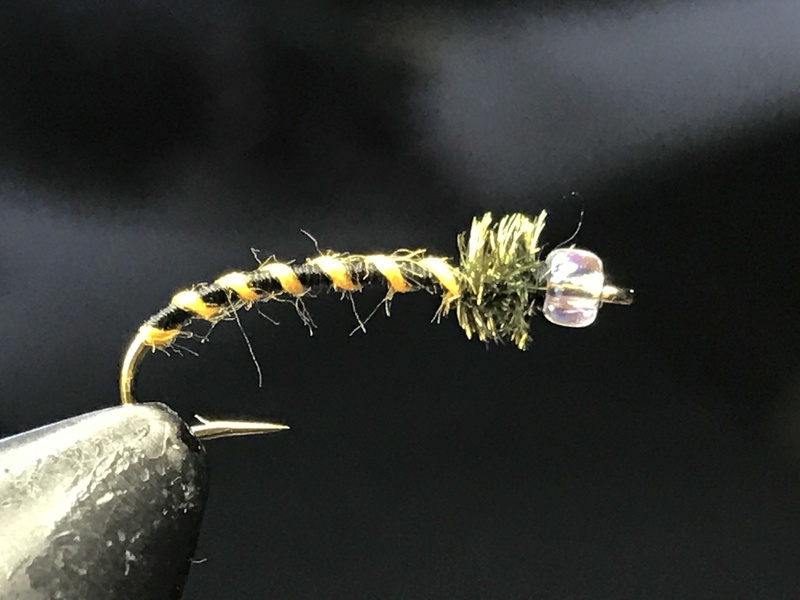 Nymphs in the size 12-16 and dries in the sizes 12-16 work extremely well. The high country lakes and streams start to thaw around Memorial Day and continue thawing through June and sometimes into July. However, getting to lakes and streams at high elevation that time of year can be quite the challenge. If a visiting angler has enough determination, persistence, and luck he/she can hit ice out and have an incredible experience with many trophy greenbacks and stories to tell upon their return home. July 4th usually marks the beginning of the high country season in most cases. This time of year most lakes and streams are thawed as well as the trails and access to reach them. Greenbacks usually spawn in May or June depending on elevation and how warm the spring has been. If spawning cutthroats are encountered, please be careful of their redds and do not trample through them or try to catch spawning fish. These endangered trout still have an uphill battle to recovery. Continue searching until non-spawning cutthroats are spotted. Chances are they will be more than willing to take a weary but well presented fly. 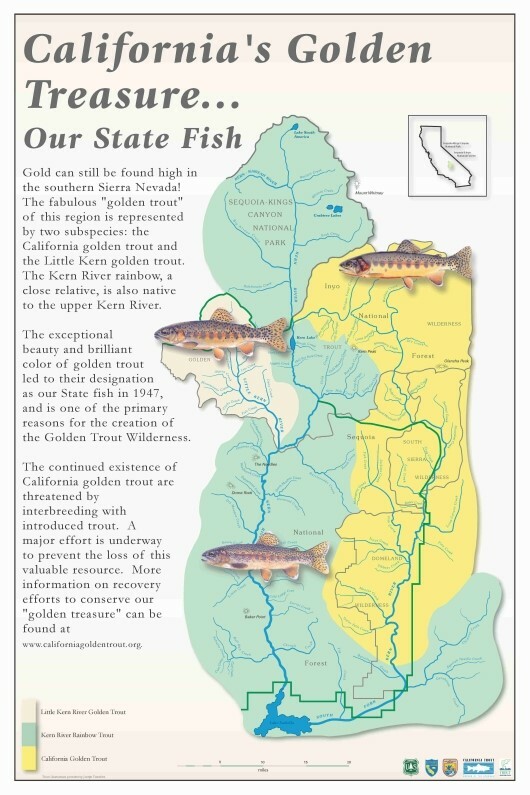 Golden trout are remnants of the Pleistocene epoch and survived the Ice Age only to inhabit Golden Trout Creek, Volcano Creek, and South Fork of the Kern River in the southern Sierra Nevada range of California. Historically, it is believed these backcountry residents inhabited meandering creeks and drainages from 7,000 to 10,000 feet in elevation. Due to altitude, the growing season is cut short leaving fish to reach an average length of 6 to 12 inches while individuals over 12 inches are rare and considered trophies. Once reaching sexual maturity at 3 to 4 years of age males will display bright, vibrant mating colors during spawning which occurs in the late spring and early summer when water temperatures reach 10° to 15° C. Females will deposit 300 to 2,500 eggs in shallow redds where they will incubate for 3 weeks. 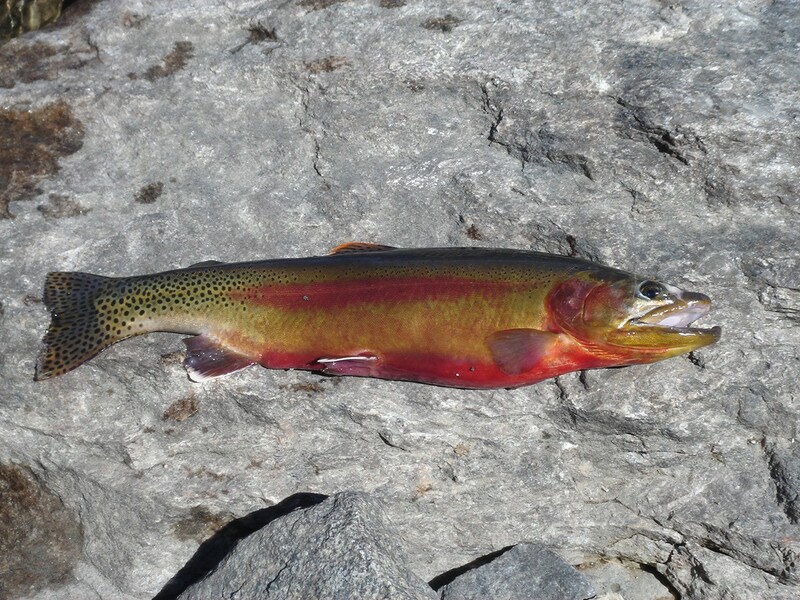 The golden trout was originally thought to be a sub-species of the rainbow trout (Oncorhynchus mykiss). However, recent genetic research suggests there are enough differences between the two to consider the golden trout as its own species. In the late 1800’s Col. Sherman Stevens transported a small number of goldens from the Kern River tributaries into Cottonwood Creek, CA. After this small population was established, eggs were routinely collected and shipped to a national fish hatchery in Bozeman, Montana throughout the late 1920’s and 1930’s. Montana would soon after establish small populations from the original Cottonwood Creek members deep in its Rocky Mountains. Although this is the earliest account of stocking efforts, golden trout have since been stocked in a number of western states and mountain ranges. Arizona, California, Colorado, Idaho, Montana, Nevada, New Mexico, Oregon, Utah, Washington, and Wyoming have all seen various stocking efforts throughout the decades. Some populations have established while others have faded for one reason or another. Perhaps the synergistic effects of competition, climate change, and dwindling habitat have left these salmonids in small isolated numbers struggling for existence. Whatever the reason for their decline, in 2008 the American Fisheries Society listed the species as threatened. Since these backcountry beauts need pristine, cold headwaters, creeks, or lakes to survive they are typically stocked deep in the heart of mountain ranges, giving the very region they inhabit its soul. In the backcountry there are three main players: brook trout (Salvelinus fontinalis), cutthroat trout (Oncorhynchus clarkii), and golden trout. Brook trout inhabit most every major drainage in the Rocky Mountain west. Due to their tenacity and voracious personality, brook trout have seriously outcompeted cutthroat trout for habitat and resources. Cutthroat trout numbers have suffered in recent history, but stocking efforts seem to be stabilizing their decline. Similar to the golden trout, these mountain residents often fail to reach trophy size of more than 12 inches. 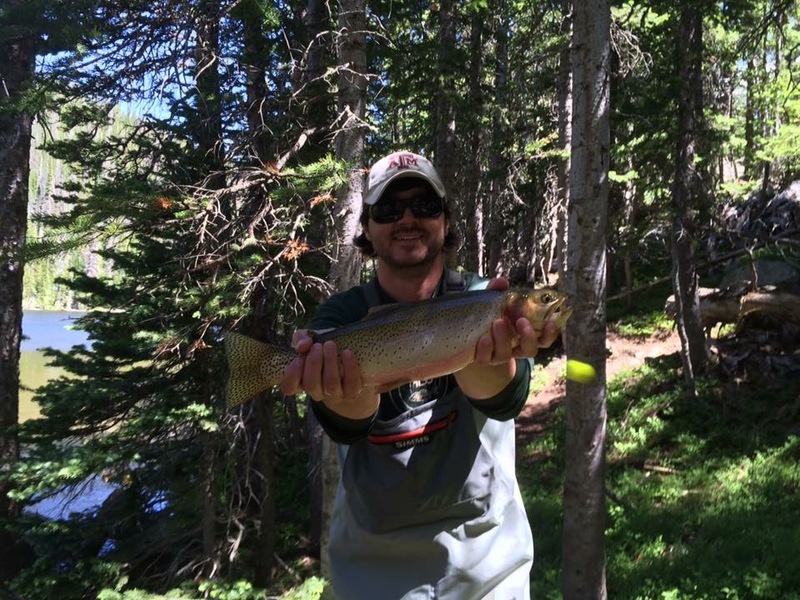 However, there are pockets of trophy backcountry cutthroats that can reach 20 inches or more. and presented a well tied fly. The conditions have to be just right for the golden to bite. Many times trophy goldens will rise to investigate a passing morsel only to reject the offering at the last minute leaving the angler in an irate and frustrated stupor, and rightfully so because those long and grueling miles weren’t hiked just to be rejected by one of God’s creations with a brain the size of a bean. But in the rare instance an angler has the opportunity to hook, fight, and land a trophy golden then they have summited the backcountry pinnacle against all odds. Taking into consideration the amount of effort required to reach these rare waterways, the paucity of trophy golden trout, and their weary stubbornness to take a fly it is easy to see why many anglers refuse to speak of golden trout locales. In these instances one could consider the golden trout to be the K2 of the backcountry salmonids while leaving the Mt. Everest pinnacle to those looking for something other than hinterland gold. If you ever find yourself in a conversation in which trophy goldens are brought up or pictures are shown, do not bother asking any revealing questions. I guarantee you will receive laughs and sly remarks. Behnke, R.J. 1992. Native trout of western North America. American Fisheries Society Monograph 6. American Fisheries Society, Bethesda, MD. Hubert, W. 1994. Exotic fishes. 158-174 in T.L. Parish and S.H. Anderson, eds. Exotic species manual. Wyoming Game and Fish Department, Laramie, WY. Marcuson, P. E. 1984. The history and present status of golden trout in Montana. State of Montana, Department of Fish, Wildlife and Parks, Fisheries Division. 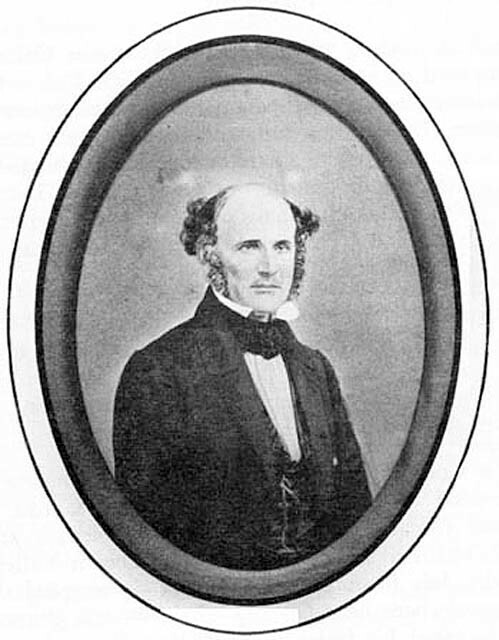 Zuckerman, L.D., and R.J. Behnke. 1986. Introduced fishes in the San Luis Valley, Colorado. 435-452 in R.H. Stroud, ed. Fish culture in fisheries management. Proceedings of a symposium on the role of fish culture in fisheries management at Lake Ozark, MO, March 31-April 3, 1985. American Fisheries Society, Bethesda, MD.